Flamenco has always been a huge passion of mine and its not until the last couple of years that I bit the bullet and went for it, booking a local class.I think im lucky to have such a brilliant teacher down the road, I love it and would now be lost without it! Well I dont wish to bash on about my passionate endeavours but my reason for this post is to take you on a mini journey that happened to me recently. 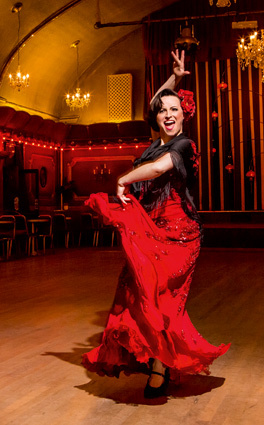 My tutor sent an email round saying that she had been approached by a leading womans magazine and would any of us in the class like to write a brief biog about ourselves and what inspired us to get into Flamenco, to submit to the magazine. First thoughts when you read something like this is… gulp. and then fear sets in. I ignored that little voice in my head that sometimes likes to lurk and stop you from doing things and swiftly poured my heart out and sent it off to them. I heard back pretty quickly, with interest and a quick ask for some photos. I sifted through loads of images finally stumbling on 2 I sort of liked and clicked send. Thats it, done… I thought, then a surprising email popped in saying would I like to come for a photo shoot in london, hair, makeup, clothes. Jumping up and down like an excited toddler thats just heard they were going to Disneyland, I was booked in. No going back now! Dancing Flamenco is one thing but being photographed – a still frame that must still capture the essence of the dance, is another! A private lesson and plenty of mirror posing later meant I was ready to rock. The day was brilliant fun, well.. who doesnt like being pampered for the day with hair, makeup and gorgeous dresses. Everyone at the magazine were lovely, made me feel at ease and there was a real buzz in the atmosphere. I took along one of my Flamenco Cds to get me and the crew in the mood – the Rumba was good. I really didnt want to let my tutor down and also wanted to represent the dance as honest and true as I could. So here’s the article, let me know what you think!